NPK Industries Mighty Wash combats more than spider mites. It works diligently to destroy other pests that may occur inside the grow room. Effectively fighting against russet mites, mealy bugs, two-spotted spider mites, whitefly, blackfly and aphids to restore or protect your grow space. Infestations are attacked rapidly and aggressively at the site of infestation. In the UK, Mighty Wash terminates spider mites at every stage, including the eggs. Use it indoors, outdoors or in grow rooms. Full directions for use are located on the container and should be followed as printed. Mighty Wash promotes a sterile, healthy and safe environment for the plants. The non-corrosive substance prevents destructive pathogens and yucky mildew from ruining your plants. It is available in a ready-to-use mixture and contains polarized H2O and minimum quantity of wetting agent. This product can be applied throughout the entire growth and flowering cycle, as well as through the harvest cycle. Dangerous and rapid invasions of spider mites and other critters can completely ruin crops in their entirety. Therefore, it is essential for growers to have effective treatment options at all times. The right options will ensure that infestations can be eliminated as they occur. NPK Industries Mighty Wash is the treatment that gets the job done. It allows plants to have a complete and immediate recovery. Spider mites populate almost any growing area in any part of the world. They feast on a variety of vegetables, vines, indoor/outdoor ornamental plants, fruit trees and berries. They generally reproduce rapidly and infest crops within a few days and destroy them just as quickly if left untreated. They are related to but not classified as insects. They are categorized in the arachnid class with ticks and spiders. Adult or mature spider mites may appear brown, red, orange, yellow, or green in colour. The most common are highly mentioned spider mites are the strawberry spider mite, Carmine spider mite, Pacific spider mite, and the European red mite. They are very small critters and when low in populations, they may need to be identified with the help of a hand lens, microscope or eye magnifier. These little critters feast on the tissue and sap of plants. They primarily populate underneath leaves in order to extract the juice from plant cells. A few spider mites may not cause extreme amounts of damage. However, when appearing in heavy populations and all feeding at the same time can quickly lead to damage. As the feeding cycle progresses, the dead cells evolve into a red or yellow colour and the leaves begin to fall off. Over time, the entire plant is destroyed and eventually dies. NPK Industries Mighty Wash is effective when used as directed. Once contact is made, critters and spider mites begin to feel the impact immediately. Your garden or plants will know the difference. Here are a few tips to follow. Always keep the container stored in a cool dry place. Don’t remove the label, as you want to be able to clearly identify the product before each use and only utilize it for its intended purpose. 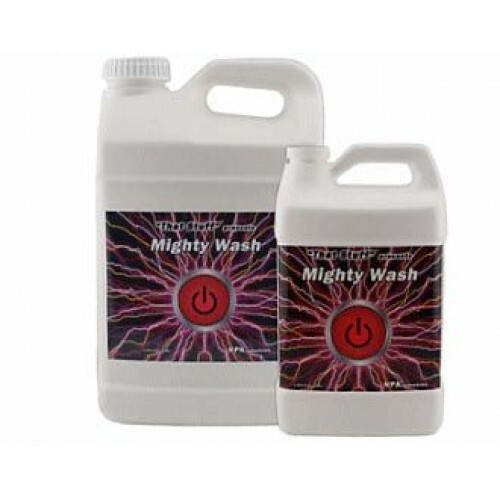 Your crops can life a healthy life free of invasive spider mites with Mighty Wash. Protect them and keep them safe from the intrusive and harmful pests that feast on crops day after day. Spray the leaves, flowers, and fruits until they are completely saturated. Remember to utilize the formula at full strength for complete effectiveness. The results will be greater than average and your crops will begin to bounce back in record time. Mighty Wash works better than many other treatments in its class. It performs as a multi-mode treatment and is better than toxic selections. Broad level, poisonous, chemical treatments may work momentarily, but can be harmful to other organisms that are beneficial and aide in the process of controlling spider mates. Spider mites are rapid breeders and also cultivate resistance quickly to pesticides that are commonly used. In some cases, some insecticides encourage the reproduction of mites. Natural and organic treatments are ideal and safer to use. It prevents the need to worry about dangerous contact or exposure to unsafe chemicals. Although spider mites can occur quite quickly, there are preventative measures that can be taken to prevent them from populating in the first place. Spider mites can be invasive and cause some growers to feel defeated if they can’t eliminate or prevent them from occurring. NPK Industries Mighty Wash makes it possible to do both by serving as a fast-acting agent that battles the infestation at the source. Crops can regain their vitality and grow into healthy productive harvests. It works by a physical means blocking the breathing holes of the red mites and insects, causin..
Dr Schimmel Spider Mite TerminatorDr Schimmel Spider Mite Terminator can be used safely throughout e..
Pyrethrum 5EC 100MLPyrethrum 5EC is a natural, professional-grade insecticide made from dried Chrysa..
Plug and Grow Trigger Sprayer Bottle is ideal for applying pest products to the plant. It has been d..
2 Litre Aqua King Compression SprayerAn 2 Litre Aqua king Compression Sprayer eliminates much of th..
NPK Industries Mighty WashNPK Industries Mighty Wash combats more than spider mites. It works dilige..